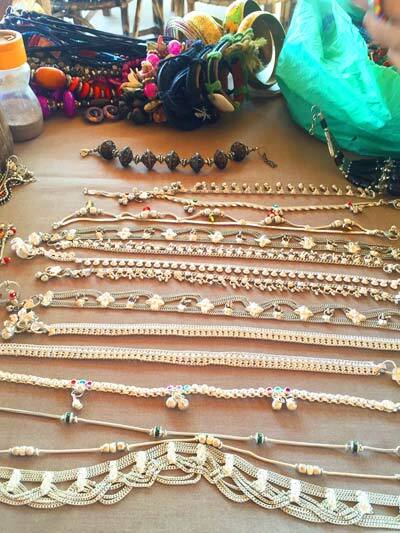 Have you ever gone to the beach and encountered beach sellers, trying out every trick in the book to make you buy things you may or may not want? 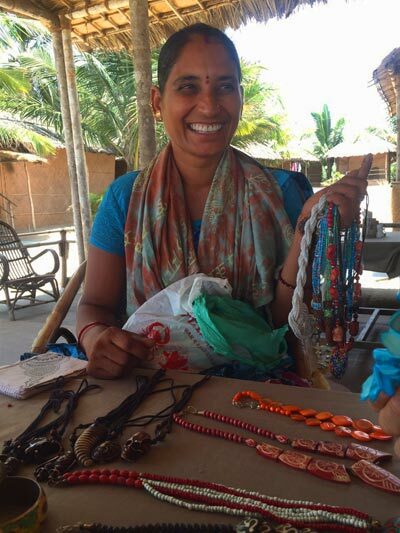 Everyday Tina walks up and down Benaulim Beach in Goa with a bundle of sarongs on her head and a large bag of homemade jewellery. After two days of politely rejecting to buy anything from her, I approached her. I asked if I could interview her about her life and share the story on Beachmeter.com. “OK, but you also buy”, she said with a smile. I agreed. Q: Thank you for letting us talk to you Tina. Can you tell a little about yourself? A: I am from Karnataka [a state in Southwest India]. I am 27 years old, and have three girls. They are all in school. My husband works with construction. Q: I have seen young girls selling stuff on the beach like you. Are your girls helping you? A: No. They are busy with school. Q: That sounds like a good choice. When did you start selling necklaces and sarongs? A: I started when I was 13 years old. I have been selling for 14 years now. I never went to school. I was helping my family. Q: Can you tell us what a normal day for you looks like? A: It’s hard work. I wake up at 6 in the morning. I start to make necklaces. Maybe at 9, I start to sell. I walk here and try to sell to people here. In the evening I make necklaces again. Everyday like this. I can make three necklaces in one day. I make most myself. 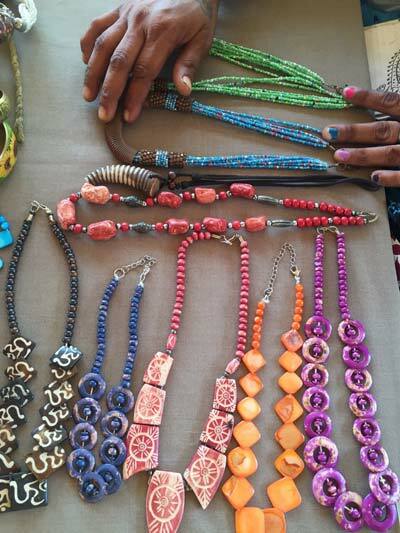 I made these [pointing at a batch of necklaces laid out on the table in front of us]. Q: How many items do you sell in one day? A: I normally sell 3 or 4 pieces. But now it’s low season, so sometimes less. Some days I have no luck. No sales. Q: How much do the best customers buy? Have you ever tried a customer buying everything? A: No. The best customers buy 4 or 5 pieces. On the best days, I can earn maybe 1,000 Rupees [15 USD]. Q: I can see that you are a good seller. Do you a special trick to make people buy? A: I try to make chat first with people. I ask about country, kids, like that. I will smile, make friends first. Q: There are more women selling here on the beach like you. Do you work with them in a group? A: No. I work alone. I know them, but we all work alone. Everyone supports own family. Q: Do you ever think about doing something else? A: No. I don’t have education. I can’t find another job. Q: Your English is very good. I think you could work many places. A: I learned English from talking to tourists. It’s many years now. But I don’t know how to work like them [points to the restaurant staff]. We start to look at the items Tina has put on the table. My attention falls on her hand. 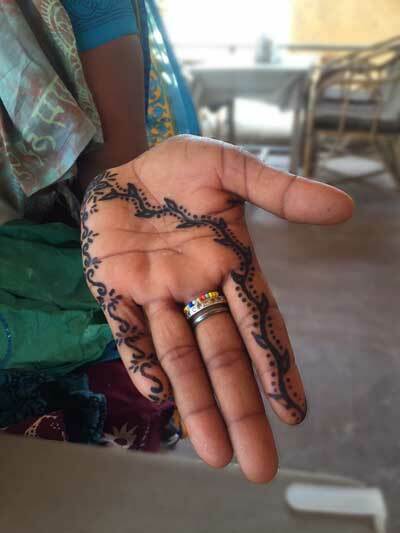 It is beautifully decorated in henna. On her other hand she has a small tattoo. This is the sign for “Ohm” – good luck, she says. “I can make henna for you,” she says. I decline and we continue to look at the necklaces and bracelets in front of us. I find a beautiful blue necklace made from seashells. She made it. She would like to sell more to me, but I stick to one. 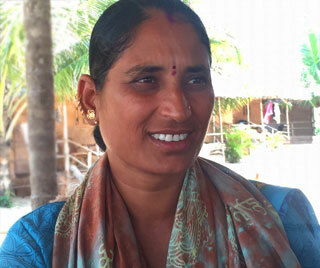 She takes the Rupee notes in her hand, touches her left shoulder with the money, then the left. 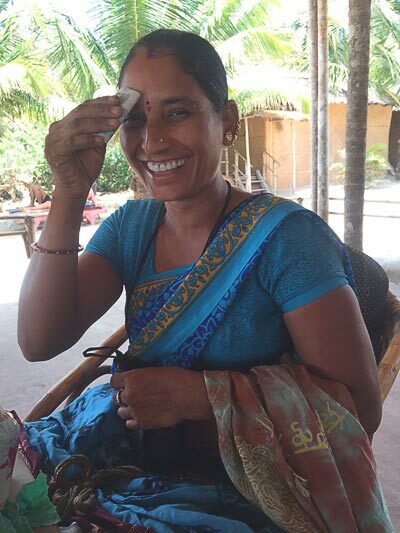 Then she brings the money to her forehead as she closes her eyes and makes a slight bow with the head. “Good luck”, she explains and smiles. Q: Thank you Tina. It was very interesting to learn about you. Good luck to you and your family. A: Thank you. See you tomorrow. Touching the forehead with hard-earned money for good luck! Also known as touts, hawkers, and vendors, among the most common things they sell are snacks, beach towels, hats, sunglasses, souvenirs, handmade jewellery, and massage treatments right on the beach. On some occasions you might just need that souvenir to bring back home or those shades to protect from the sharp sun rays. But most probably you will be slightly annoyed by persistent hawkers, especially if a new one interrupts your beach relaxation session every other minute. Seeing the beach touts walk up and down in the burning sun while carrying bundles of items for sales, some people get that awkward guilt-feeling of turning them down. Others simply ignore them completely. The balance is a tough one – you can be rude and not acknowledge their existence or you can be friendly but waste their time by chatting and not buying. Of course, the more you chat, the more items will be unwrapped, and quickly appear around your neck, on your hands, and around your head, quickly building up a sense of guilt-pressure to buy something. We usually consider the beach seller from our own point of view, that of the beach tourist. 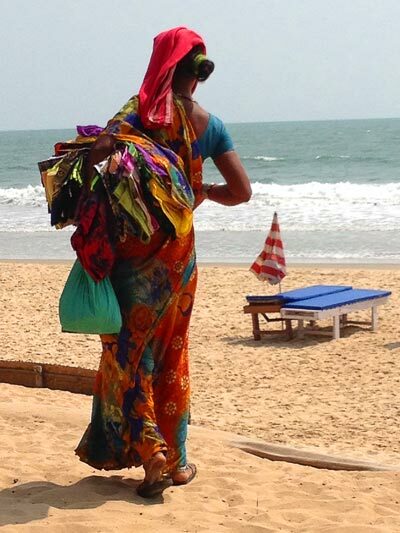 We thought it would be interesting to inquire about the life of a beach seller and find out who the person behind is.